INSEAD and I go back a long way. Kind of? I first heard about INSEAD when I interned at Standard Chartered Bank back in 2011. There was a lady who worked on my level from INSEAD ’08. At that time, I had never come across the school before and I remember looking it up in Google, just because the name INSEAD sounded interesting. A couple of years down the road, after I started working, I had been re-acquainted with INSEAD several times when my friends spoke about their friends who went to school at INSEAD. But these occurrences were not unusual, just your run-of-the-mill hearsay about INSEAD being a famed MBA school. What was unusual however, was what happened during my last two years in Portland, Oregon where I was working. I was lucky to have the opportunity to explore many cities and countries in those two years. I visited the towering Dolomites in Italy, photographed the majestic Mount Fuji, weaved through the trails of Patagonia in Argentina and Chile, scaled up Machu Picchu in Peru, got drenched by the insane spray of the Iguazu Falls in Brazil and even saw the Northern Lights dancing in Iceland. During my travels, I met a few INSEAD alumni, and got to hear more about this school which was tucked in a corner of Buona Vista, which was coincidentally, where I went to high school. Then, my interest in the school went beyond its quirky name, as it sounded like a place I wanted to be. I dug a little deeper and also spoke with some of my friends who were INSEAD alumni, and found that the international focus of the school really resonated with me. At that point, I somehow found myself at a crossroad and was wondering if I should plunge into a different field, having worked in the engineering field for some time. While all my brushes with INSEAD were seemingly random, I decided that they were a sign. So after four years as an engineer at Intel, I hit the books, took my GMAT and applied for INSEAD. The application process is, as most would know, challenging to say the least, but when I received that email to set me up for interviews with two alumni, I was stoked! After the interviews, I crossed my fingers (and toes) and waited for good news. I still remember the moment clearly; It was the morning of 30 March, a day before the deadline. I just got out of bed and was still having my breakfast when I got a call from country code +33. I swear I have never been so excited picking up an unknown phone call before, and I even took a screenshot of it before I picked up. Lo and behold, I was accepted! It wasn’t long before I started packing and preparing for my big move. The last few weeks in Portland were really hectic; packing, donating and throwing away the things I had accrued over the years. I don’t like goodbyes and saying farewell to my co-workers and friends was so hard. The day eventually came where I left with a heavy heart, but with much anticipation of the exciting year ahead. It has been about 3 weeks since I got back to sunny Singapore. So much has changed but those that matter remain steadfast, like the heat and the humidity! I been sitting in Spanish classes daily from 9am - 3pm and spending evenings doing Spanish homework. Rinse and Repeat. Hola! Como estás! It hasn’t been easy picking up a third language (in compressed time), but I am loving the learning and the new friends I am making! While school has been keeping me busy, I decided to start updating my blog again for my friends on the other side of the world who would like to know what I am doing. Also, I hope my blog entries can be of some help for those who are interested in applying for business school! Perhaps my blog would be a ‘sign’ for those who just need a nudge to apply for business school. I will end off with an iconic pic of Singapore that I snapped at sunset recently when I was at Marina Bay Sands to collect my Standard Chartered Marathon race pack. 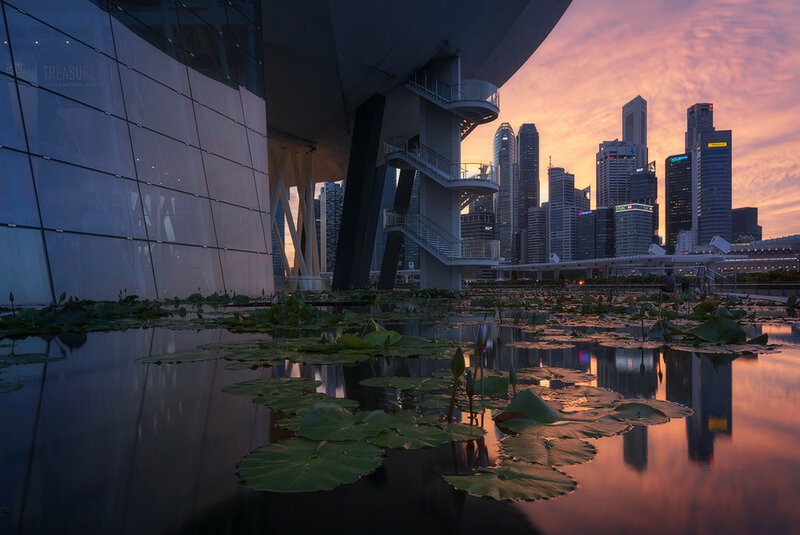 I couldn’t resist stopping by the Art Science Museum when I saw the sky starting to glow. This is also my first landscape shot of Singapore since I got back, as I haven’t had much time to use my camera. Signing off to prepare for my Spanish intensive course exam and presentation this Friday. Hasta la vista!